Worrying about the logistics of cooking a Christmas dinner, and how exactly you’ll get the various parts of your roast ready in time? Don’t panic – it’s actually more straightforward than many people realise. When roasting a turkey, it’s vital that you give the bird time to rest after cooking. This helps the meat to relax slightly, preventing it from being chewy, and reabsorb lots of great juices which keeps it moist. This resting time, which experts recommend you should do for at least an hour, means that when you remove it from the oven, you’ve got the space and time needed to cook the trimmings for your roast. 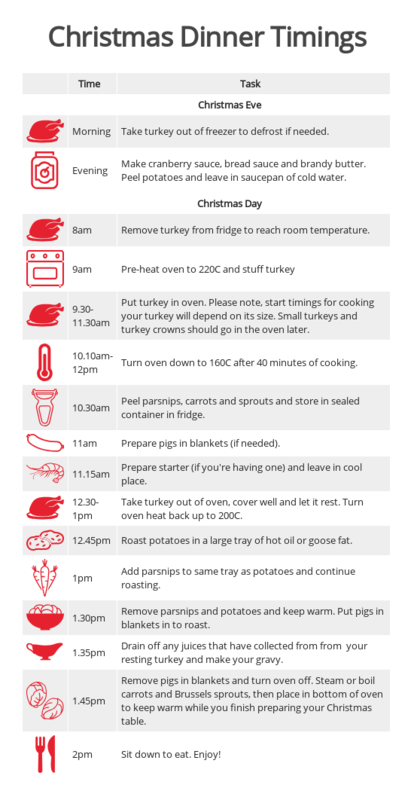 Take a look at our guide to Christmas prep and cooking timings, to help you work out when you should be taking things in and out of your cooker. We’ve based our timings on a sit-down time of 2pm on Christmas Day, but if you’re eating earlier or later, you should adjust accordingly. 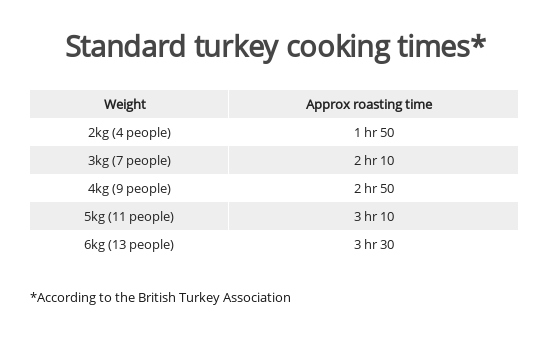 Scroll down to find our guidance on how long you’ll need to cook your turkey for, depending on its weight. If you regularly find that your oven is just too small to get everything inside, it might be time to think about upgrading to a bigger model. When we test built-in ovens, freestanding cookers and range cookers, we check to see how well popular dishes fit into the oven. This includes roast chicken, roast beef and roast turkey. Each time, we check whether you’d be able to fit that plus a tray of roasties in at the same time. While oven manufacturers will claim a particular volume, this isn’t always reflective of how much space you’ll get to cook in. We measure the useable oven volume – the width of the oven cavity, the distance from the inside of the door to the back of the oven and the height from the top of the lowest shelf to 3cm below the top of the oven, to give a real feel for the actual space available. 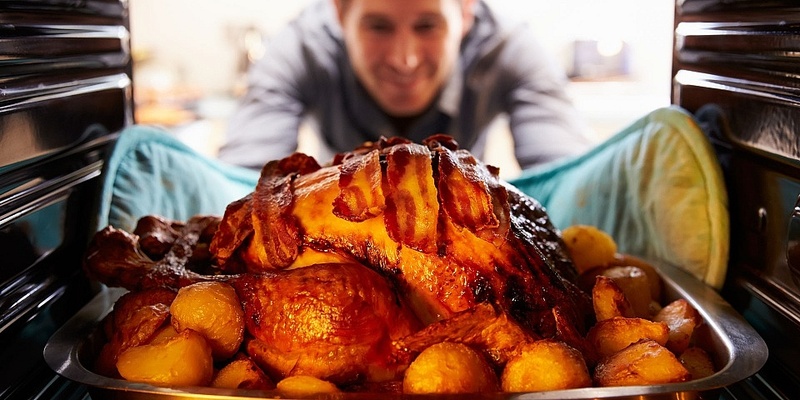 Take a look at the ovens and cookers below to find out why they’re good for Christmas dinner. This single built-in oven has a little over 52 litres of usable space, which is at the bigger end of the scale. You should be able to fit a family-sized turkey in its cavity and still have enough room for a tray of roast potatoes. Read our full review of the Samsung NV75K3340RS to find out if it’s also a fast and accurate oven. 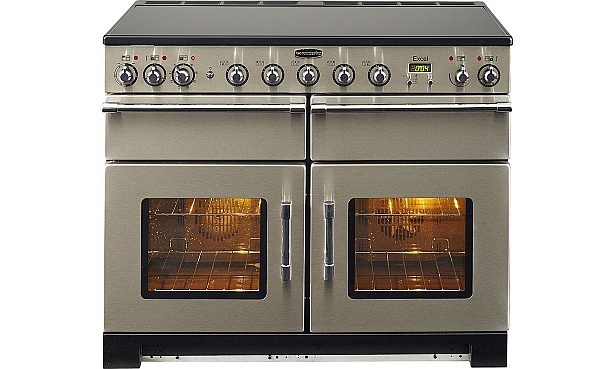 This is a double built-in oven, which should give you some flexibility when it comes to cooking a big roast. 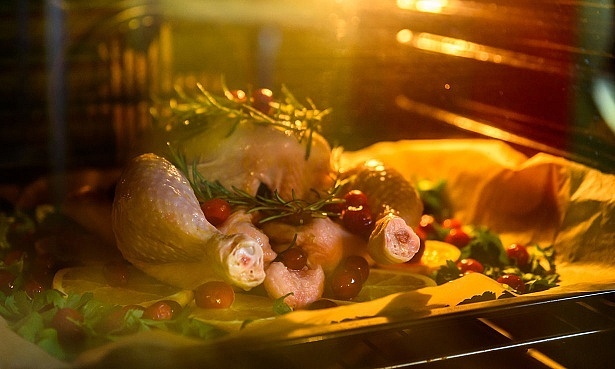 The main oven has plenty of space to roast a turkey and fit a tray of spuds in at the same time, and the top second oven, which is also fan-assisted, can easily fit a smaller joint, or your pigs in blankets stuffing and extra roast veg, or your dishes to keep warm. 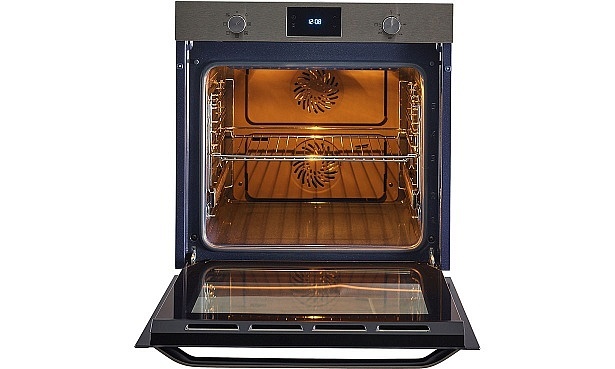 Read our review of the AEG DCE731110M to see if this oven is also easy to use and clean. Range cookers usually have two ovens, which provides that extra bit of space that can be so useful come Christmas Day. 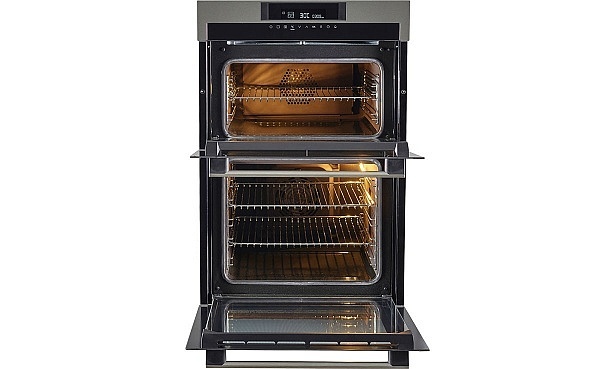 This Rangemaster cooker has ample space in both ovens to fit your roast turkey, and also has a warming oven that’s perfect for storing items until you’re ready to serve. Just don’t forget to put the pigs in blankets on the table! Read the Rangemaster Nexus SE 110 Black review to find out if the hob and grill are any good on this range cooker. This range cooker has an induction hob, so should be speedy when it comes to preparing your gravy and boiling and steaming your veg. Its two ovens have 51 and 50 litres of useable cooking space, which means they’re both large enough to fit a turkey and a tray of veg in together. 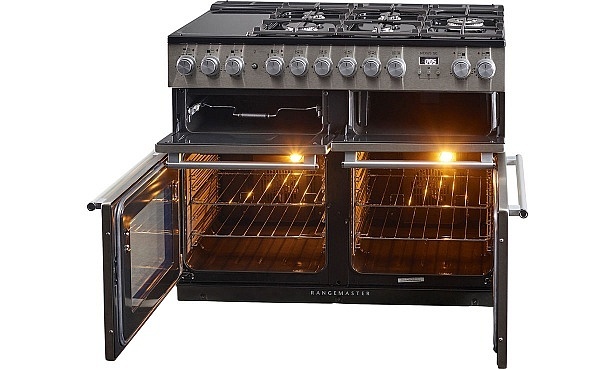 Find out if this range cooker is good at simmering and baking by reading the Rangemaster Excel 110 EXL110EISS review. 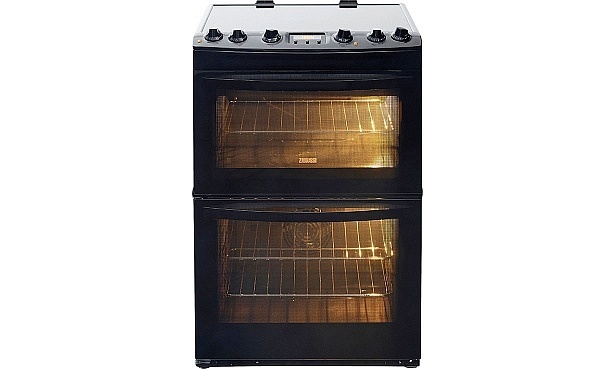 This freestanding cooker has two ovens and the main oven has five shelf positions. There’ll be space for your turkey and tray of roast potatoes in the main oven, while you cook any trimmings in the top oven. Read our review of the Zanussi ZCI68300BA freestanding cooker to discover if it has an effective grill and accurate oven thermostat. How long should you cook your turkey for? When we polled Which? members about whether they’d ever come to cook their turkey and discovered they couldn’t fit it in their oven, only 4% admitted ever experiencing this. 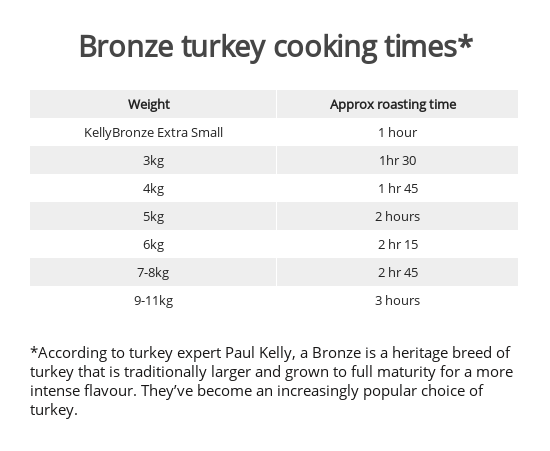 This will only work on smaller birds as, according to turkey expert Paul Kelly, larger Bronze turkeys have much stronger bones, which you’d need a pair of garden shears or hacksaw to get through, rather than standard poultry scissors. Plus, larger birds will be too wide once spatchcocked to fit the width of most ovens. Alternatively you could simply remove the legs and cook them separately. While you might get chilly outside, this can be a good option if you have a large hooded or kettle barbecue. Take a look at our barbecue reviews to pick out one that might be suitable.